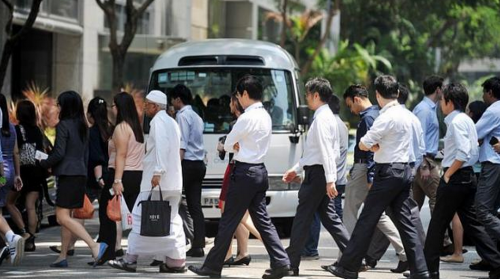 Wages grew at a slower pace in the second half of 2014 even though demand for workers remained high, the Monetary Authority of Singapore (MAS) said in its bi-annual Macroeconomic Review released on Tuesday. Even though more workers entered the labour force, vacancy rates remained elevated and well above the 10-year historical average, the review said. At the same time, the overall unemployment rate edged down to 1.9 per cent from an average of 2 per cent in the first three quarters of 2014. The resident unemployment rate also fell to 2.6 per cent from an average of 2.8 per cent. Despite this, salaries of Singapore residents rose 1.6 per cent in the second half of 2014, considerably lower than the 3 per cent in the first half of the year and the 10-year historical average of 3.7 per cent. This slowdown was due to a number of factors, the MAS said. First, the higher proportion of part-time workers in the resident workforce, from 6.8 per cent in 2008 to 10.5 per cent in 2014, has lowered average wage levels and economy-wide wage growth, even though the wages of part-time workers have increased recently. Given that the monthly pay of part-time workers is typically about a quarter that of their full-time counterparts, overall wage growth could have been 0.4 percentage point higher if the proportion of part-time workers in the labour force had remained the same as in 2013, the MAS' review said. Second, job growth for residents has been concentrated in the domestic-oriented sectors, such as construction, retail trade, administrative and support, and food services. The average pay in these industries is typically lower than that in export-oriented sectors such as manufacturing, wholesale trade and transport and storage, which have accounted for an increasingly smaller proportion of the workforce since 2010. Third, wage gains could have been dampened by sluggish economic conditions. Salary adjustments in the export-oriented sectors have been capped by uncertainties and weak growth in the external economies, while firms in some domestic services sectors have also not been able to raise wages significantly given their difficulty in passing on higher costs to consumers. Lastly, the continued sluggishness in labour productivity has reduced the extent to which firms are able to increase wages for workers. Labour productivity fell by a further 1.2 per cent in the second half of 2014 over the corresponding period in 2013, led by a drop in the construction and services sectors.